Patrick Thomas Sano, age 25, passed away unexpectedly on January 26, 2019. Born May 2, 1993 in Charlotte, North Carolina, Patrick had resided his entire life in Alliance. Patrick was the beloved son of Lynn (McCallum) Penturf and the late David Sano, Jr. He was also preceded in death by his grandfather, David Sano Sr. and uncle, Thomas Sano. Patrick is survived by his brother, Andrew Sano; grandmother, Helene Sano; grandparents, Jerry and Mary Kay McCallum; mother, Lynn (McCallum) Penturf; stepfather, Barry Penturf; stepsisters, Ann Kesterke and Stephanie Shealy; stepmother, Sandy Allison; stepbrothers, Greg Arbogast and Aaron Arbogast; stepsister, Brooke Myers; and numerous aunts, uncles, cousins, nieces and nephews. 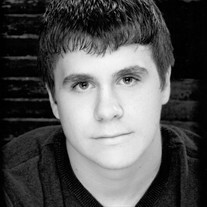 Patrick was a 2011 graduate of Marlington High School. He participated in many sports growing up including being a member of the 2007 William Penn Hot Stove Baseball Ohio State Champions team. Patrick was an avid sports fan and especially enjoyed following the Ohio State Buckeye's football. He was also a member of the Union Avenue United Methodist Church. Patrick's family loved him dearly but know he is at peace in God's loving arms. A private service will be held with Pastor Jonathan Truax officiating. In lieu of flowers, memorial contributions may be made to the National Alliance on Mental Illness either online at www.NAMI.org or by check sent to NAMI, P.O. Box 49104, Baltimore MD, 21297.